Doug Bennett, Joyce Gibson, Jo-an Jacobus, Theresa Oleksiw, Sukie Rice, and Martha Hinshaw Sheldon. 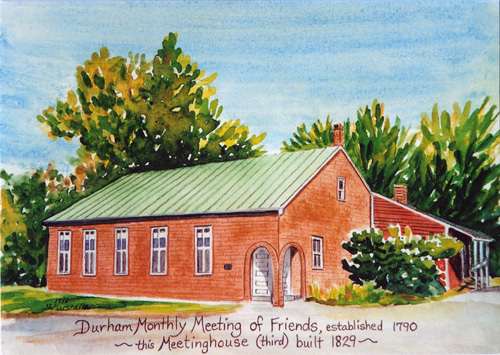 At the January Monthly Meeting of Durham Friends Meeting, we brought a report that sketched a number of alternative models for an additional part-time paid position at the Meeting. That was what we had been asked to bring. The Monthly Meeting was unusually well attended, and we are deeply appreciative of the many thoughtful comments and perspectives we heard in the consideration of the report. It seemed to us that those in attendance spoke from depth and listened unusually carefully to one another. In this report we want to (A) summarize what we heard and (B) tell you how we propose to proceed. 1. We are a healthy Meeting. We affirmed we are a healthy, strong middle-sized Quaker Meeting. We are still adjusting to not having a pastor. 2. We have some things we need to work on. At the same time, we know there are some things we need to work on doing better, especially pastoral care, outreach, and coordination. 3. An additional paid position? Perhaps it is the way to go, but perhaps it isn’t. The report listed some reasons from having another paid position (confidentiality, reliability and accountability), but in the discussion we also lifted up a reason not to have another paid position: we all need to feel responsible for what the Meeting does, and we should all feel called to contribute. 5. We need to talk together more. This was an important discussion together: a joined discussion in depth. We need to have more of these. (B) How we propose to proceed. Given the discussion at the January Monthly Meeting, we are reluctant simply to bring forward a single recommendation for a paid position, at least at this point. We heard affirmation that the Meeting needs to work on all three of these matters: pastoral care, outreach and coordination. These are three important matters. All three need attention, but we do not think we should take the same approach with each. Indeed, we think each needs to be addressed in its own way. So, at this point we propose the following ways to work on each. (1) Pastoral Care. The pastoral care team has now become part of Ministry and Counsel. Ministry and Counsel has taken responsibility for pastoral care, but has not really had an opportunity to consider how best to make sure we are meeting the needs of Meeting members in this regard. Approach. We should ask Ministry and Counsel to consider how best to proceed with pastoral care, and to report and make recommendations to Monthly Meeting. (2) Outreach. At present, Outreach isn’t really any person or committee’s responsibility though there are some good efforts being made, especially by Christian Education and Peace and Social Concerns. We lack a Meeting-wide understanding of what we should be doing about Outreach and who should be doing it. Approach. This should a topic for discussion at a Monthly Meeting in the near future, perhaps March. Our Working Group would be willing to make preparations for having this discussion. (3) Coordination. A relatively recent innovation, better known to some than others, is to have a Clerks’ Meeting from time to time: a gathering of the Meeting Clerk with the clerks of the various standing committees. This is one approach to coordination and seems to be doing good things. But is this enough? Does this Clerk’s Meeting connect with all the different parts of the Meeting that need to be coordinated? Again, they should report and make recommendations to the Monthly Meeting in the near future. Perhaps consideration of these three matters, as we’ve sketched them, will lead to a recommendation for a paid position, or perhaps not. Perhaps it will lead to a new standing committee, or perhaps not. At some point we also believe the Meeting Handbook should be updated and revised, but we believe that should wait until we take these further steps. This entry was posted in Committee Reports. Bookmark the permalink.